It's hard to know what to expect from a young pitcher's debut. 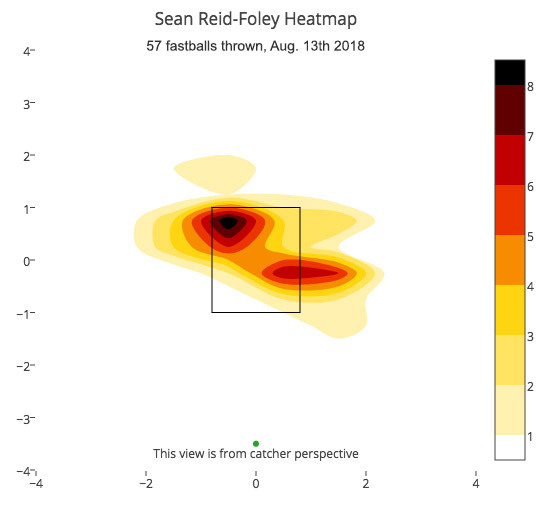 But in Monday night's start, Sean Reid-Foley flashed his potential while also displaying areas of his game that need improvement. On Monday night, Sean Reid-Foley made history. 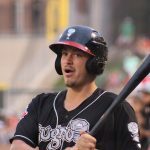 He and catcher Danny Jansen made their major league debuts in the same game. 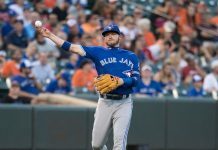 No Blue Jays battery had ever done that and it was the first time it happened in the American League since 1967. Reid-Foley’s stat line was a less spectacular feat. He went 5 innings, gave up 3 earned runs while walking 3 and striking out 3 batters. In terms of major league debuts, this wasn’t bad! 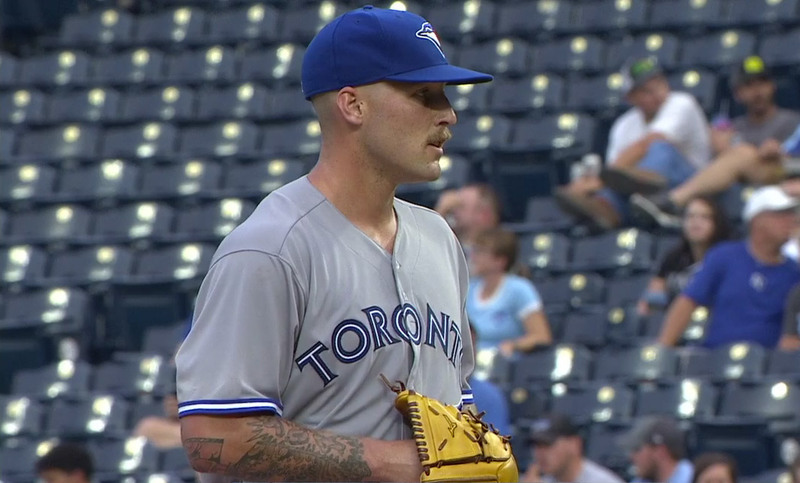 He didn’t look overmatched and lasted five innings. 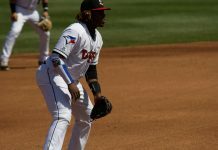 It was against one of the worst offences in the league, however, which should be considered when breaking down SRF’s start. 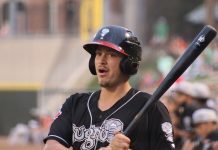 What we saw last night was what minor league observers have seen in 2018. Reid-Foley has a good pitcher’s build, a quality repertoire and is a competitor. He found himself in trouble to the Royals at times, offering free passes and giving up loud contact, but did a decent job of battling through it. Let’s inspect the details of his start a bit more closely to find out where he can improve and what to look for moving forward. 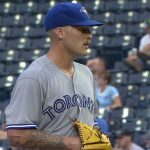 Reid-Foley threw 37 of his 57 fastballs for strikes. That’s a fine percentage, but the problem was when he threw them. He found himself behind in 2-ball and 3-ball counts 15 times, and each time he threw the heater. 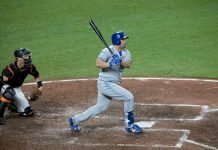 The Royals produced a .638 wOBA in those situations (league average is .448) and the Royals are not a very good team at the plate, relatively speaking. 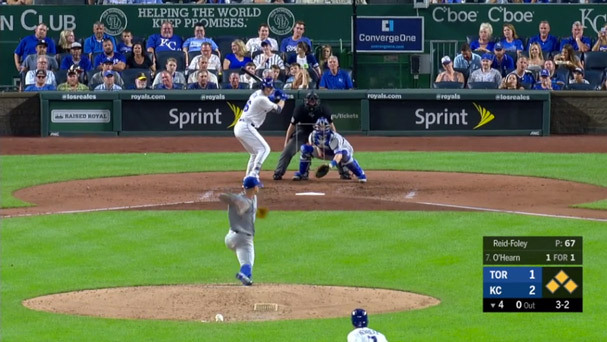 It goes to show that big leaguers, whether they are stars or scrubs, can hit a fastball, especially in a hitter’s count. It’s possible catcher Danny Jansen purposely put down the sign for fastball so often because it’s a pitch SRF has a lot of confidence in. That’s certainly a defendable action in a pitcher’s first major league game. It’s also a plus pitch, with good velocity and natural movement. Jansen and Reid-Foley have a good relationship so I have to assume the pitch sequencing was something they were in agreement on ahead of time. But as more of the league sees Reid-Foley, he’ll need to be less predictable when he gets behind in counts. Especially against some of the fastball-mashing teams in the American League. Until 2018, command of his pitches had been a major contributor to Reid-Foley’s bloated ERAs and walk rates. In AAA this year he turned a corner and posted a 2.95 BB/9 rate while striking out 10.3 K/9. 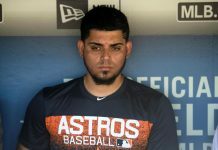 Some of those struggles appeared to come back in last night’s debut, however, as he routinely missed his spots with the four-seamer. 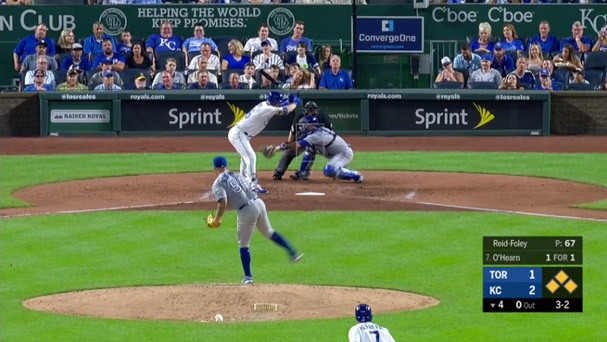 While the pitch still caught the edge of the zone and was called a strike, it missed its intended target by about a foot and a half. But hey, it was his first major league pitch! We’ll cut him some slack since his adrenaline was surely running high. 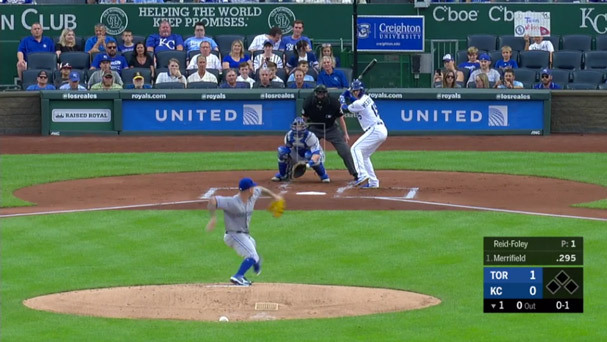 Let’s look at pitch #2 of the night. Again, Jansen sets up low and away to Whit Merrifield. Reid-Foley misses again, this time riding up and away. 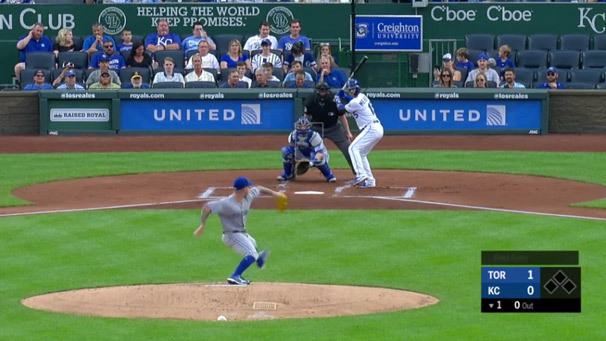 That pitch missed the target by a good two feet. Maybe SRF is still amped up, but this was a theme that continued. Let’s jump to the 4th inning. The bases were loaded, it was a full count, and Reid-Foley went back to the well, accepting Jansen’s call for another fastball. And once again, the catcher presented a low target. Another big miss that Jansen actually did well to catch, as you can see him in a twisted position after the ball missed inside. 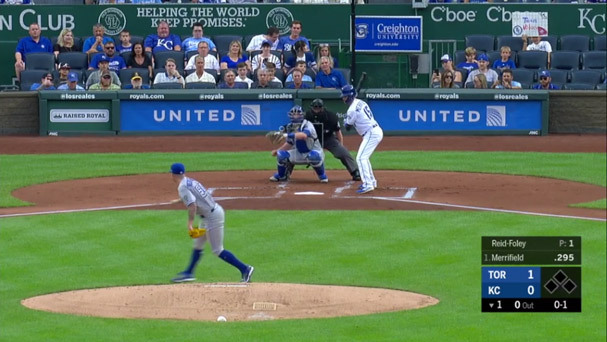 Unfortunately this pitch walked in the 3rd run of the night, which was all the insurance the Royals would need. The following heatmap illustrates how this problem manifested over the course of the night. Of course, he intended to throw some fastballs high in the zone, but the horizontal spread is also a concern. Reid-Foley was missing badly at times, and badly to both sides of the plate. It’s possible the hot, muggy night in Kansas City wore Reid-Foley down a bit. He was visibly soaked in sweat and his velocity waned in the 5th inning. His average four-seamer peaked at 95.3 mph in the 2nd inning and dropped to 93.6 by the 5th. 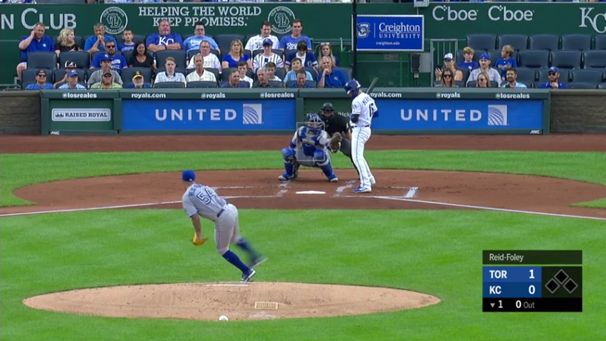 In the inning previously, the 4th, he saw his release point on the fastball move farther to his arm side. He also threw 33 pitches in the 4th. As his pitch count rose, his mechanics may have gotten a little out of whack. Hardly a significant criticism given the uncomfortable conditions and the excitement of his first career start. It’s hard to glean much information from the 20 sliders and 13 curveballs he threw last night. But possessing two breaking balls with slightly different shapes, and the changeup, should help him avoid platoon splits. Provided he can command them. All of these things are minor observations from one start, and one start does not make a career. Baseball’s a game of adjustments and Reid-Foley may already need to make a couple. 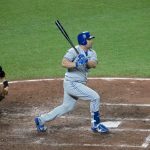 Too many fastballs in hitters’ counts and inconsistent fastball command usually spell trouble. 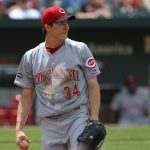 But his track record at Buffalo this year suggests that he has the potential to settle into a role as a dependable mid-to-back of the rotation starter. His next start lines up to be at Yankee Stadium this weekend, which would obviously prove a more difficult task than the Royals. But these are exciting challenges for young players and a window towards the future for fans. Reid-Foley is such a competitor that I’m sure he’d tell you to bring ’em on – that he wants to face the best despite being a newcomer to the league. 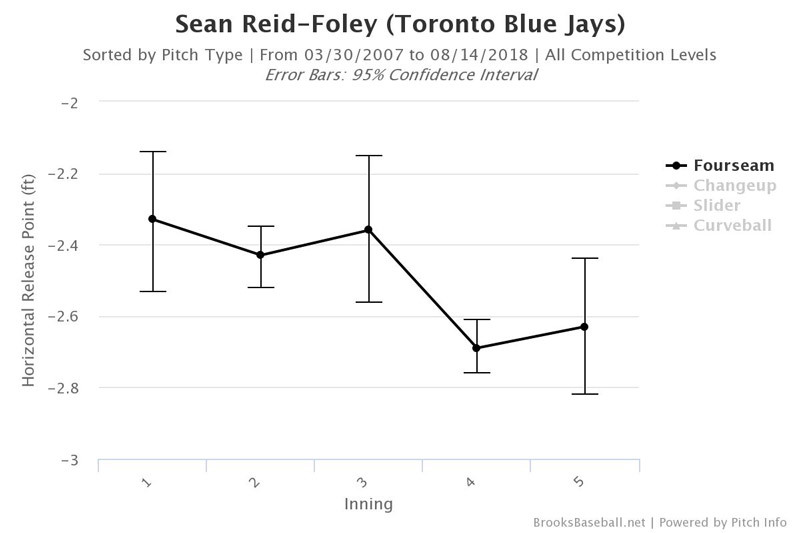 Sean Reid-Foley didn’t need to dazzle in his debut for Blue Jays fans to be impressed with his stuff and hopeful for the future. He has the makings of a more-than-capable starting pitcher. 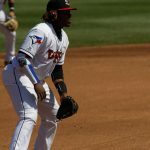 Next articleManaging Expectations For Vladimir Guerrero Jr.